Today, Nadella might just be getting his way, as Microsoft’s Impression score — which asks consumers if they have an overall positive or negative impression of a particular brand — has reached its highest point in the last two years, according to new data from YouGov BrandIndex. In the past few weeks alone, after Nadella announced major plans to reorganize the company and amid the latest Windows update, Microsoft’s Impression score has climbed from 36 to 40. 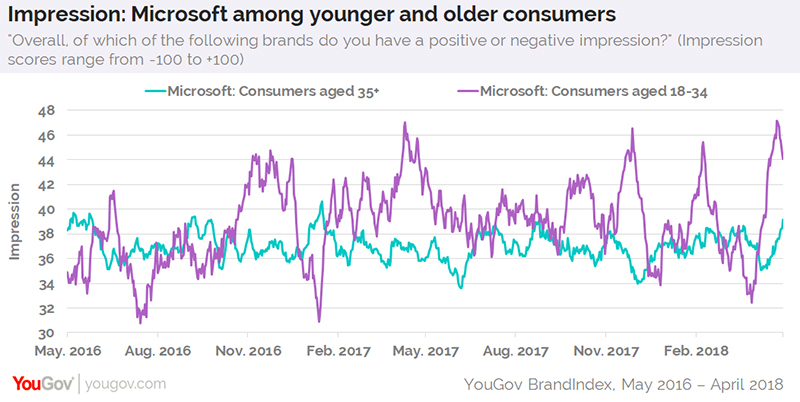 Another reason for Microsoft to feel both appreciated and optimistic about the future is that US adults aged 18-34 are showing more fondness for the brand than those aged 35+. At present, younger Americans give Microsoft an Impression score of 44, while their older peers give the brand a 39. As Microsoft focuses on expanding its cloud services, recent figures from YouGov Profiles show that consumers aged 18-34 are much more likely to use cloud-based storage than those aged 35+. Young people are also more likely to have confidence in the technology: 52% say they trust that using cloud storage is just as secure as saving information on their computer or phone, compared to 39% of Americans aged 35 or older. Additional numbers from YouGov Profiles reveal that US adults who hold a positive impression of Microsoft are more likely than members of the general public to believe that, in the future, artificial intelligence will help humans in most of their daily tasks (67% vs. 62%). At the same time, Microsoft admirers are also less likely to agree that people only worry about personal data on the internet if they have something to hide (20% vs. 24%).